Born in 1955, Michel Tueni graduated from Assas Paris II in 1978. His areas of practice range from local to international law, marine law, aviation, banking and international trading. He is a board member and/or legal advisor of several main Lebanese institutions such as Middle East Airlines-MEA-, MEAGH, MASCO, Central Bank, BLC Bank, Finance Bank, SNBSL bank, FransaBank SAL, HSBC and many others. ICC arbitrator and litigator, Michel tueni has also headed many teams in big international cases. He is member of the governmental committee for Chebaa farm. 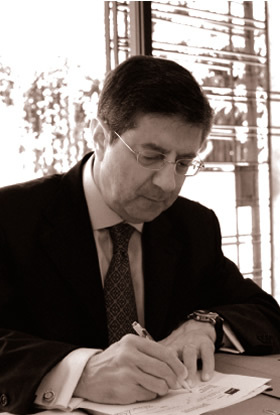 Maitre Tueni is also a member of the Lebanese dialog committee in St Cloud (2007) and Doha (2008). Apart from his business activities, Michel Tueni works and supports a numerous charity institutions such as St Georges' hospital and foyer for elderly people.